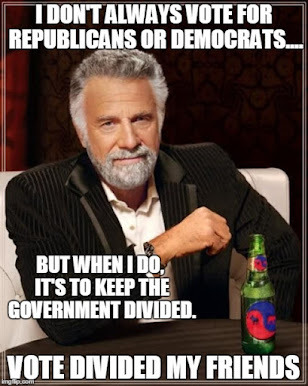 That 13,665,926,643,255 number is the dollar amount that we, as American citizens, now owe to pay for all the spending that we demanded from the politicians that we elected. If you have a problem sorting through all those digits, that number is around $13.7 trillion. It doesn't look so bad when you write it like that. "New numbers posted today on the Treasury Department website show the National Debt has increased by more than $3 trillion since President Obama took office. The National Debt stood at $10.626 trillion the day Mr. Obama was inaugurated. 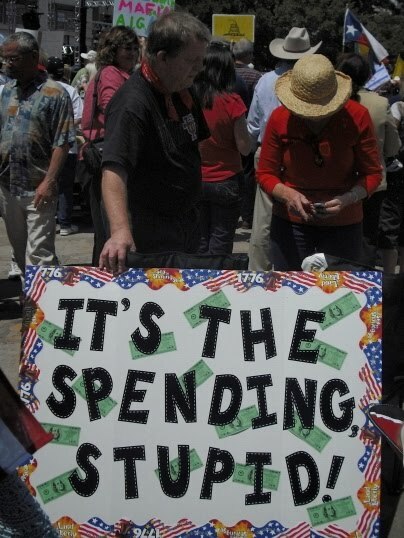 The Bureau of Public Debt reported today that the National Debt had hit an all time high of $13.665 trillion. The Debt increased $4.9 trillion during President Bush's two terms. 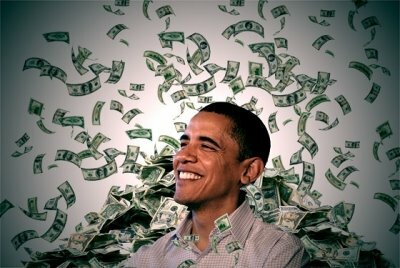 The Administration has projected the National Debt will soar in Mr. Obama's fourth year in office to nearly $16.5-trillion in 2012. That's more than 100 percent of the value of the nation's economy and $5.9-trillion above what it was his first day on the job." It is not like we are not getting value for all that debt. We are paying for at least two wars, subsidizing the defense of Japan, Germany, and South Korea, policing the world, and attempting to rebuild several Mideast nations in our image. A record historically ginormous pork filled stimulus plan that does not stimulate. Taking over a corrupt bankrupt insurance company and two bankrupt car companies. Paying down and subsidizing risk the mortgages of people who cannot afford the houses they bought at wildly overpriced levels in a bubble (caused by government policy distorting the housing market by pumping dollars into home ownership for everyone). Bailing out the banks that made the bad home loans by investing in pools of securitized mortgage instruments that hold the bad loans (not to mention the Fed loaning banks money for free). A trillion dollars in new spending on a "reform" health care bill that does not control health care costs, does not cover everyone, is not paid for, and no one understands (least of all the Democratic legislators who steamrolled it over GOP opposition). As reported by the CBO last week, all this largess added up to a record 21.4% increase in mostly unfunded additional Federal spending in the almost two years of One Party Democratic Rule. For most people, this looks like a pretty easy equation. A massive increase in irresponsible unfunded spending over the last two years resulted in massive record setting increases in the deficit over the same two years. It looks superficially as easy to understand as 2 + 2 = 4. But that would be wrong. You see this is actually an example of "scared voters not thinking clearly". To correctly understand what is happening requires the sophistication and big brains of a liberal Nobel prize winning economist. Paul Krugman is the man for the job. He explains that to understand this spending correctly, you need to consider the spending within the context of a completely imaginary GDP that is much larger than the one that is - you know - here with us on Earth, in the actual U.S. of A. in what we like to call - reality. 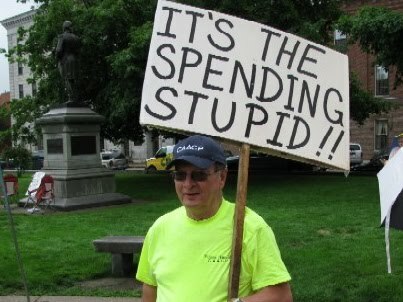 Then he completely throws out several categories of spending where some of the biggest increases took place, and Ouila! 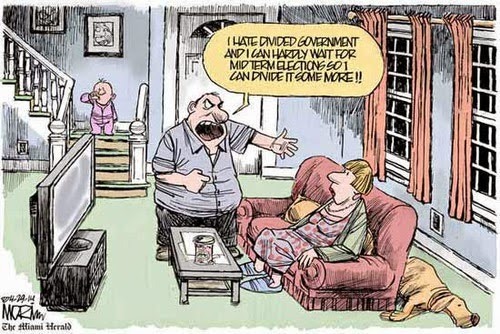 Obama is a positively parsimonious small spender! "Clearly, while Republicans have been somewhat irresponsible in running up debt, Democrats have managed to be almost three times worse than Republicans. Just as clearly, they have no intention to cut spending to correct this, but instead plan to hike taxes to fund their spending spree. 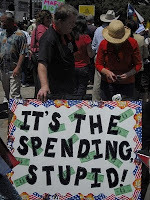 And they’re being led by a President who wants to spend even more, as his own budget projections show." 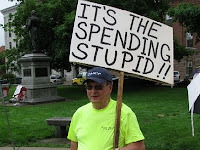 Or even more succinctly - It's the spending stupid.